A truly unique Cardiff opportunity! Large twinhome with stunning ocean views; clean, move-in ready condition but set to blossom with your vision. Magnificent upper deck for entertaining & soaking in the rays, top floor boasts lifted ceilings and open floor plan. Lots of natural light throughout. Ocean views from your kitchen, dining area, and living room as well as your master suite! 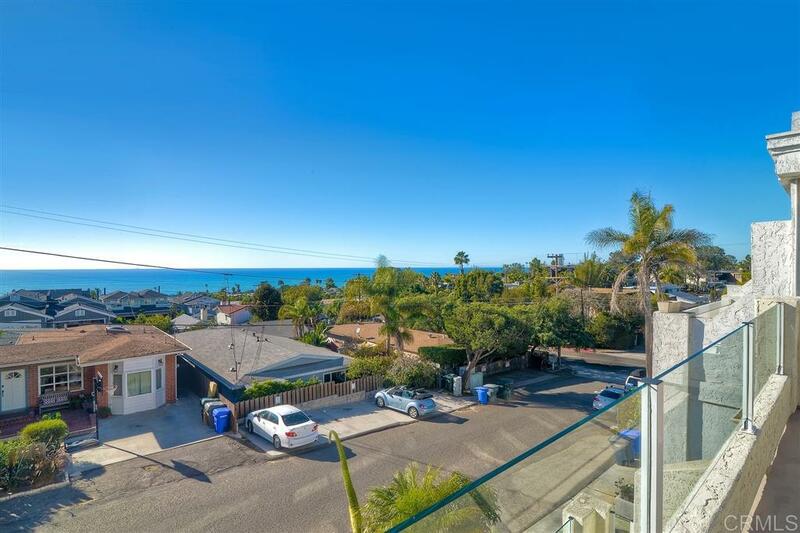 2065 esf, 3BR/2.5BA and attached 2-car garage with spacious laundry room on first level and bedrooms on the second level., Incredible Cardiff twinhome in Walking / Composer District with gorgeous blue water ocean & sunset views! West of I-5 and close to beach, shops & restaurants! 2065esf, 3-story, 3BR/2.5BA & attached 2-car garage with storage and separate laundry room on 1st level! Home boasts open floor plan on top level, brand new carpet, neutral paint and warm earth tone tiles throughout. Perfect for investors looking for rental income. Extra large Master Suite offers walk-in mirrored wardrobe & abundant natural light from your own private view deck. Luxurious Master Bath nicely equipped with dual vanity and walk in shower. Guest bedrooms located at separate end of home from master suite, providing additional privacy. Upstairs, you'll find a full wet bar and a powder room conveniently accessible from combination Dining/Living Room. Great volume with open flow throughout family room, dining room & kitchen. Generous skylight & cozy window seating is integrated within dining area. Family room with inviting fireplace and vaulted ceilings opens up to oversized view deck with panoramic ocean views! Expansive view deck to family room allows for seamless outdoor to indoor entertaining. Dumbwaiter (presently non-operable) could be converted to single person elevator.